Atlanta, GA (April 25, 2017): David Weekley Homes, the nation’s largest private home builder, is offering a Dream Deal promotion in the community of Vinings Brooke. Homebuyers who build a new home from the ground up between April 20-June 30, 2017, will receive $10,000 that can be used toward a home discount, decorator options or closing costs when utilizing one of the builder's preferred lenders. Additionally, homebuyers who select a move-in ready, or ready soon, showcase home during this promotion will receive special pricing incentives.There are several two-story homes available now. Priced from the mid $400s, homes in Vinings Brooke feature Craftsman-style exteriors and nine distinct floor plans ranging in size from 2,400–3,700 square feet with three to six bedrooms, three to five full baths with both upstairs and downstairs owner’s retreat options. Other features include a three-car garage and basement option on select homesites. Residents in Vinings Brooke also have access to activities such as biking, hiking, skating and skateboarding at the 61.5-mile Silver Comet trail. Vinings Brooke is conveniently located to Dobbins Air Force Base and Lockheed Martin Aeronautical Plant and Home Depot headquarters. Students attend Cobb County schools and there area also a number of private schools located in close proximity to the community, including Whitefield Academy. 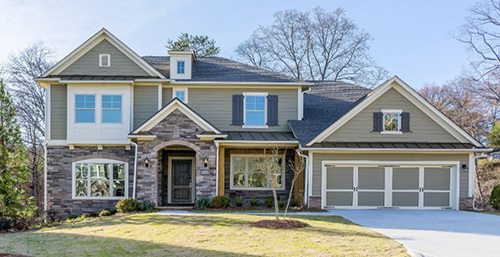 For more information about Vinings Brooke, call 404-481-3906.The model home is located at 5416 Bluestone Circle in Mableton and is open daily for tours. The Harlingen is available now for immediate move in.